When the Reality is pushed out into the swing plane the head becomes stable still square to the target line. As featured in Australian Golf Digest May 2000 issue, page 89. 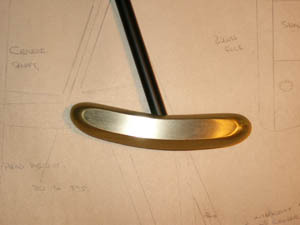 At DROP Putters we are well known for our handcrafted putters and the unique ability we have in blending the traditions of club making with the technologies of today. Today, whilst we are still handcrafting our putters the research and development that has gone into our latest creation, "REALITY" would challenge that of the major companies. There are 4 models in the REALITY range. A few of their features are highlighted below. � Hand machined totally brass alloy head. � Sweet spot is marked only after fully assembled. � "Eye dot" alignment system allows identical set-up each time. 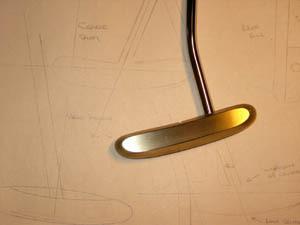 � Clean straight lines of the head allow you to easily square the face to the line of the putt. � Low face profile gives a lower center of gravity than that of the ball for initial lift and roll. 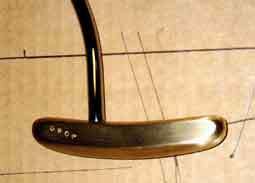 � RB 1 model is set up for standard lie angle, weight and shaft length. � RB 2 model has a curved sole, which allows greater variation for lie angle fitting. � RB 3 model provides a dual face allowing you to putt left or right handed. � RB 4 model has the dual face and the lie angle variation. Our REALITY putter has been designed to remain completely stable along the swing plane line throughout the entire stroke. You don't have to duplicate the exact same grip pressure to counter the head twisting when you putt, confidence returns and those clutch putts drop in. 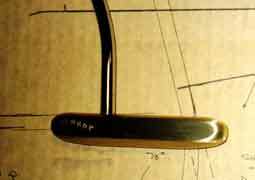 RB 1 Model is set up for standard lie angle, weight and shaft length. RB 2 Model has a curved sole, which allows greater variation for lie angle fitting. 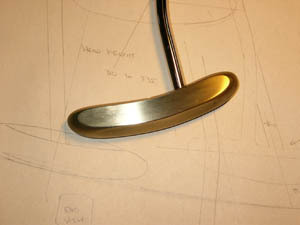 RB 3 Model provides a dual face allowing you to putt left or right handed. RB 4 Model has the dual face and the lie angle variation. RB 5 . This model has all the characteristics of the RB4 except we use a straight shaft that enters the head of the putter dead centre.